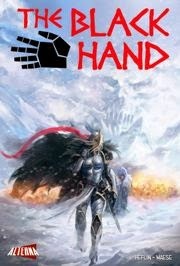 The Fellowship was fortunate enough to obtain a copy of THE BLACK HAND #4 from Alterna Comics. Erica J. Heflin writes, with art by Fares Maese. Victoria is not popular among the Black Hands. But she is their sister, and they will fight with her. The White Frost is coming down the mountain, toward the Black Hands and the boy they’re protecting. Victoria has doubts, though, about what the White Frost seeks. Once she gives in, gives herself over, the battle can truly begin. And it’s really no battle at all. The White Frost and the Grey Boy are not the whole story here. This is Victoria’s story, and she’s learning how to accept her role in the Order. The Order has quite a bit to learn about her as well, but they’re coming around. The Black Hand is not just a name, either; there’s a power there that we know little about. The art is really cool (pun intended) – it’s not easy to do snowscapes well, and there’s an amazing panel early in this issue that’s just a closeup of Victoria’s right eye. This book has some really interesting story ideas, and I’m a sucker for fantasy anyway. So check out this title. THE BLACK HAND #4 is available now through ComiXology or at alternacomics.com.